One of my passions (besides online marketing) is traveling. I love to meet people, learn about cultures, enjoy the nature and experience new tastes. 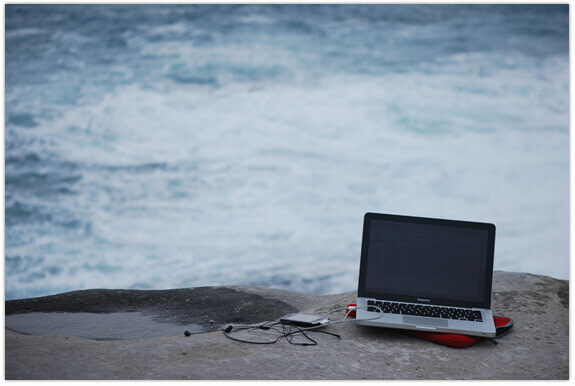 Since my work (online marketing) gives me the opportunity to work from wherever I want, I’ve been abroad for quite a bit: over the last 3 years I’ve spend half of my time abroad. Sometimes I travel without focusing too much on work, sometimes I’m primarily focusing on work, and sometimes it’s a bit of both. For the past 7 months I’ve been living in Sydney, Australia (roughly 17,000 KM away from home). I’ve been there before (July ’08 – Jan ’09) and it’s my definitely my favorite city so it was an easy choice to go back for a while. I hired a place to stay near Bondi Beach and an office near Darling Harbour and I was good to go to “live the dream” Down Under again. During the week I worked from a shared-office called Vibewire, a great place where like-minded entrepreneurs make sure there is a great work hard, play hard atmosphere: just what I need to be productive! During the weekends I tried no to focus on work, I rather enjoyed Sydney and other parts of Australia for a bit. As most entrepreneurs would recognize, “not working” just doesn’t exist. There’s always something to get done. Since I didn’t want to go to the office in the weekends (I wanted to have some sort of holiday-feeling) I just took my Macbook Pro, picked a spot and started working. I took a few pictures of some of these spots I used to work at every now and then, and I decided to share them with you guys in this blogpost. Why? Because I believe it shows what the real benefit of online marketing is: pure freedom. The Botanical Garden in Sydney was one of the first places (in Sydney) where I started working mobile. It’s close to the city so it’s easy to walk to and just work for a few hours on a Saturday-morning, for example. Great working spot! Every now and then I did the Coogee – Bondi coastal walk, definitely on of the most beautiful walks in Sydney! Sometimes I just took the day for it (even though it’s a ±2h walk), and did ±1h of work at every potential working spot I saw. Not the best way to do something really productive, but great for inspiration! Sydney is by far my favorite city, and looking at the Opera House makes me realize I was actually living there. Great spot to get some work done while having one eye at the Opera House! 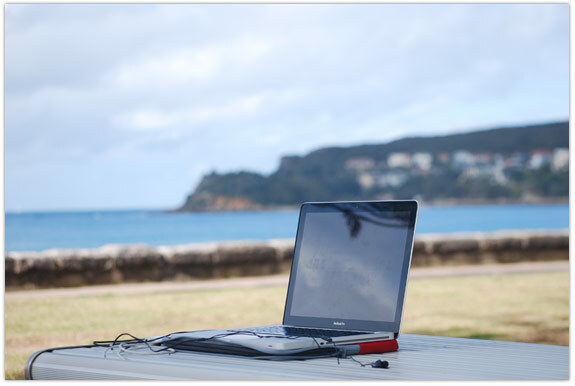 My favorite mobile working spot: Manly Beach. Tables and chairs are provided, which makes it a bit easier to be really productive while working from the beach. I hope these images will inspire you guys. Not to work at these exact spots (in fact, there are countless spots that are way more impressive to work from), but to open your eyes that you can do whatever you want: If you want somethin’, go get it. Period. Just so you know: I just moved back to the Netherlands a few days ago. Not for long though, since I’m flying back in 8 weeks time to travel throughout Australia, Thailand, Laos, Cambodia and Vietnam for a period of 3,5 months. Cool pics Wilco! 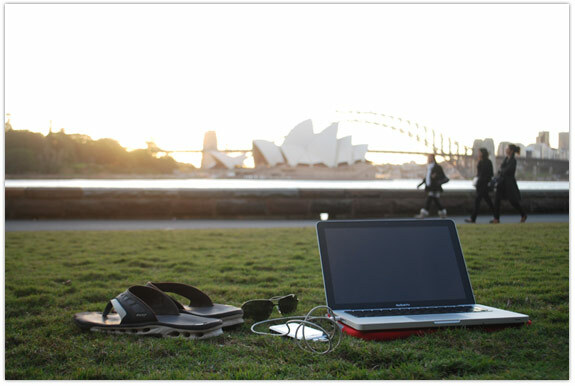 Yup Botanical Gardens and Dawes Point are some of my favourite spots for blogging, I should take my laptop down there and work and relax more often 🙂 Nice choice I have a Vaio as well! Great idea and great photos. What camera are you using? Thanks André! Can’t wait to go back to Australia (luckily I’m going back in 1 month). I used my Nikon D60 for these photos!